In a previous post, I explained the idea of worship response stations and their use in ministry to children. I am going to unpack each station in a series of posts, starting with the prayer station. The Bible teaches us to “pray without ceasing” (1 Thessalonians 5:17), so I believe prayer is essential to Children’s Ministry – before, during, and after worship services. I’d like to look at ways to use prayer during worship services with kids – specifically when used as a response to the hearing and teaching of God’s Word. Most of us are familiar with the traditional “altar call” prayer station. This is where the teacher/preacher speaks and then calls people forward for prayer, either en masse to pray with the preacher or to receive individual prayer from pre-selected prayer counselors. The focus of the prayer is usually related to the points of the message, whether a call to follow Jesus or for healing or for God’s strength to overcome a challenge in life, etc. There is also the method of having people pray in their seats after the message with no call to get up and receive prayer. And some pastors simply tell people to seek out a leader after the service if they have questions or a request for prayer (sometimes with prayer counselors waiting in a particular location, like the front of the sanctuary or in a prayer room somewhere else in the church). I preached the message and then closed by inviting the kids to come forward for prayer if they wanted to respond to the message. I had about half a dozen prayer counselors ready and they came forward before the kids so the kids could find one of them. I encouraged all the kids that if they saw a friend come forward for prayer that they were welcome to join that friend and stand beside them in prayer. I also mentioned to the many adults in the room that if they saw their own child (whether in their own family or in their cabin group) and wanted to stand beside them in prayer that they were also welcome to do so. The worship band came on stage and began leading everyone else in some slower paced worship songs. After about one song, I opened up the entire room to all of the many worship response stations, sometimes having a large group prayer to ask God to prepare us and speak to us during the worship response stations. The prayer counseling station then stayed open as one of many response station options. Kids took advantage of it at various points throughout the entire response time. Even adults (including myself) took advantage of it. And that leads me to the next thing we tried with the prayer station – the “kids pray for adults” station. I think it was one of the kids that suggested it to me and I thought it was brilliant. I had led something similar before when I was a Children’s Pastor at a Tuesday night prayer meeting that was led by kids. The idea is so simple and incredibly life-changing. So on the second night of these worship response stations, I opened up the “kids pray for adults” station. It was separate from the “adults pray for kids” station, which was still there. I told the kids about it and said that any kid who wanted to pray for adults could come work the station and be available to pray for any adult that came forward for such prayer. We had a few dozen kids come to the station and they stood there ready to pray throughout the worship response time. I even encouraged some of the girls who were there for a long time to go try some of the other stations. They said they wanted to keep working the prayer station. Of course I let them, since all the stations were optional and had no time limits. 1. It humbles us adults to hear the prayers of a child. 2. Children pray very sincere, concise, heartfelt prayers. They are not like us adults who pray like the Pharisees with prayers to sound super-spiritual that go on and on. 3. Children pray with childlike faith, which is the model of faith Jesus teaches us to have (Luke 18:17; Mark 10:13-16). Don’t you want prayer from someone with strong faith? Then have a child pray for you. 4. It empowers children and it is our way of telling them that they are as much a part of God’s family as adults and have just as much (if not, more) to contribute to the Kingdom of God and ministry to others. It is this last point – about empowering children by letting them use their spiritual gifts – that I think we most often get wrong in Children’s Ministry. We usually view Children’s Ministry as the time for us adults to download information into the brains and hearts of kids. But Jesus told us to be like children in our faith. So why don’t we more often let kids teach us and give them opportunities to use their gifts and bless both adults and other children? It goes against our intuition, but so also does the Gospel of grace. 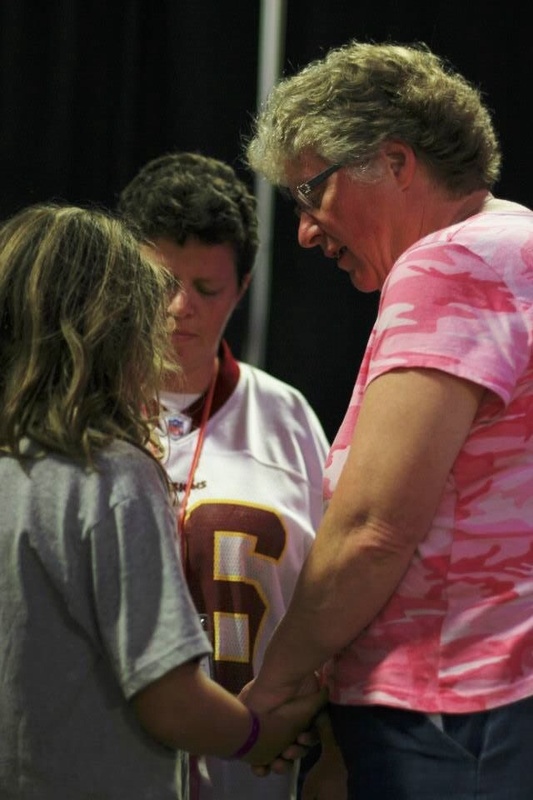 Let the children come to Jesus – and let them pray! 1. Call ahead make the proper arrangements for the visit. Make sure you know the building, the floor, the room number, and the best time to arrive. I call the child’s parent/guardian and express that I’d like to pay a “cheer up” visit to the child. With heightened security in children’s areas, make sure you know what kind of ID to bring along. 2. Call the child by name. My wife gave birth to our first child a few weeks ago. While in the hospital after the birth, we were happy to receive a visit from the Hospital Chaplain for prayer. But we noticed that during the 5-10 minute visit, he never asked my wife what her name was. Then when he prayed for us, he said something like, “Lord, please help ‘the wife’…” Again, I appreciate his visit and prayer, but it seemed very impersonal due to not using her name. Everyone, including children, love to hear their names. So get their name and call them by name in conversation and prayer. 3. Bring along a “bag of tricks” (puppets, cards, games, coloring, magic tricks, etc.). I happen to be able to juggle. So I bring along some balls to juggle for the kid. I also bring a few simple magic tricks that anyone can do (the change bag and the magic coloring book). But the real hit of the hospital visit is the puppet friend. I bring along a small female puppet named “Sunny.” Sunny loves to play games like “I Spy” and sing songs like “Old MacDonald Had a Farm…” with the child. If you’re a seasoned ventriloquist, then that’s great. But if you’re like me and cannot do ventriloquism, then don’t worry. I have found out that the child is never looking at you anyway when the puppet is talking. So bring a puppet (or a sock or a brown paper bag if you don’t have one) and have fun with it! 4. Be conscious of time – don’t stay too long. We can really wear out the child and the family if we stay too long or visit too many times. Every situation is different and every family is different. So exercise wisdom and discernment depending on your situation. I have found that 15-30 minutes can be plenty of time to connect with the child, play a few games, and pray together with the family. The visit can be even shorter if there are scheduled check-ups and procedures the child needs to undergo. A visit that is too long can suddenly become counterproductive and become a drain on the child and the family. 5. Pray and read the Bible with the child and family. This helps us remember our purpose for coming. The puppets and magic tricks are good for cheering up. But ultimately, we are here to offer spiritual comfort and encouragement in the name of Jesus. I believe prayer and Scripture reading are the best ways to facilitate this. The prayers and Scripture obviously don’t have to be long and drawn-out, but rather sincere and appropriate. Passages from Psalms can be good. 6. Be sensitive when it comes to discussing anything about the child’s medical issues or condition. Why the child is in the hospital is really none of my business unless the family chooses to disclose that information to me. When speaking with the child, I try not to talk too much (if at all) about their medical condition. They have doctors who work with them all day concerning the medical issues. When praying for the child and family, we can simply ask them how we can pray for them. Then we can pray accordingly. Furthermore, as pastors and leaders we should not discuss any medical information with the public or the congregation unless given permission by the family. 7. Mourn with those who mourn. Most of us have had to experience a chronic illness or death of a young person somewhere in the circle of our influence and ministry. Entire books are written on pastoral care for children who die or have chronic illnesses. And I am no expert on those things. All I can say is that we will never have all the answers and should never appear to have them. We are here to listen, pray, offer hope, and mourn with those who mourn. Hospital visits are an effective way to be the hands and feet of Jesus to children and families. May God guide you and your ministry when you visit the sick and pray for their needs. Jesse Joyner lives with his bride of 7 years, Sarah, and their brand new daughter, Keziah Grace (born Sept 30th, 2010) in Richmond, Virginia. For the past 11 years, Jesse has entertained and inspired audiences around the world with a juggling show that teaches kids about the Bible. He is also the Children’s Pastor at Commonwealth Chapel in Richmond, Virginia. He and Sarah are both graduates of Taylor University in Upland, Indiana and Asbury Theological Seminary in Wilmore, Kentucky. For more information on Jesse and his ministry, Jesse the Juggler, go to www.JesseTheJuggler.com. You can also find Jesse on Twitter at www.twitter.com/JesseTheJuggler and on Facebook at http://www.facebook.com/pages/Jesse-the-Juggler/139511922567.